Currently unavailable to order. Expected to arrive in 2 days. Want to be notified when stock arrives? 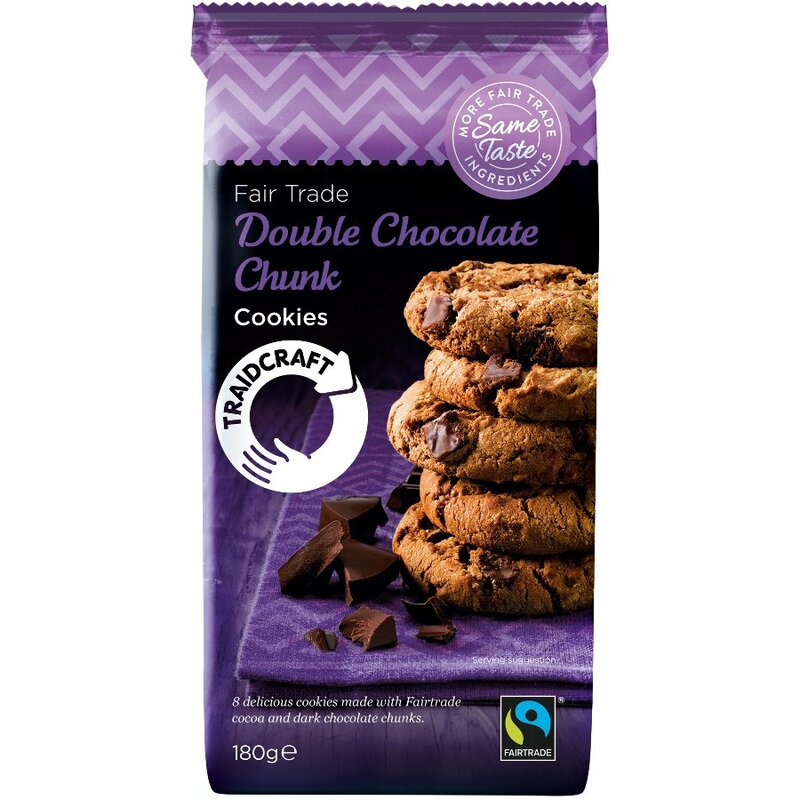 Give yourself a Double Chocolate biscuit treat with these truly delicious Fairtrade Cookies from Traidcraft. Made using Fairtrade cocoa from Ghana and Fairtrade sugar from The Kasinthula Cane Growers Association in Malawi, these crunchy biscuits are the perfect way to indulge your sweet tooth. Fortified Wheat Flour (Wheat Flour, Calcium Carbonate, Iron, Niacin-Vitamin B3, Thiamin-Vitamin B1), Sugar, Palm Oil, Dark Chocolate Chunks (15%) (Sugar, Cocoa Mass, Cocoa Butter, Emulsifier: Soya Lecithin), Oats, Invert Sugar Syrup, Cocoa Powder (2%), Raising Agents: Sodium Bicarbonate, Disodium Diphosphate, Natural Flavouring, Salt. Plain chocolate chips contain: cocoa solids 47% minimum. Store in a cool, dry place out of direct sunlight. Once opened store in an airtight container. 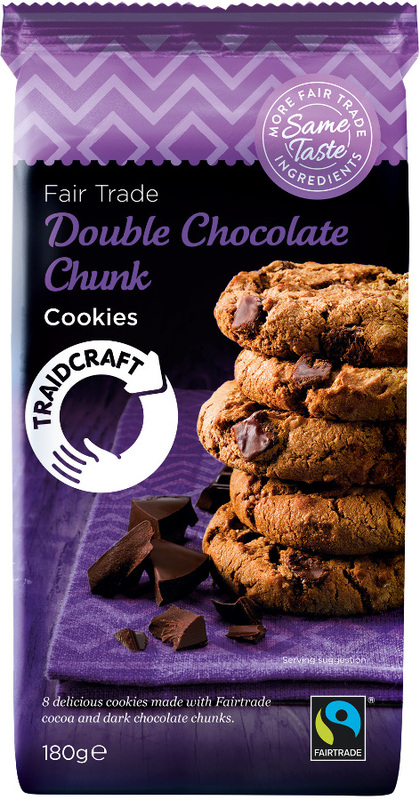 The Traidcraft Fairtrade Double Chocolate Chip Cookies - 180g product ethics are indicated below. To learn more about these product ethics and to see related products, follow the links below. I wish I'd bought hundreds of packets - love them! Didn't last long. They were lovely. Q: Please can you state the ingredients? A: Hi, the ingredients of these cookies are as follows: Wheat Flour, *Sugar (19.9%), Vegetable Fat, Plain Chocolate Chunks [16.7%]: [*Sugar (8.4%), *Cocoa Mass (7.0%), *Cocoa Butter (1.2%), Emulsifier: Soya Lecithin], Oats, Invert Sugar Syrup [2.7%]: [*Sugar (2.2%), Water], *Cocoa Powder (1.6%), I hope this helps. Robyn. 18 out of 21 found this question and answer helpful.